vouches for it. The Flavor Bible also lists rhubarb and fennel and rhubarb and brown sugar as being good matches, so I played on that by serving sauteed fennel bulbs alongside the pork and using brown sugar and fennel seeds in the brine. As so many of the other Irish food bloggers have already said, the meat was already outstanding to begin with, and brining it meant it was even more moist, tender and flavorful. (The same is true of Kelly’s cider‐brined pork chops, which are the best pork chops I’ve ever had.) The herb crust and rhubarb keep the flavors bright and fresh, perfect for springtime. This recipe will make more compote than you’ll need for dinner, but we happily spooned the leftovers on top of yogurt and granola the next morning. A big thank you once again to Bord Bia! Make the rhubarb compote while you’re making the brine, and all you’ll have to do the next day is pop the pork into the oven to roast. To brine the pork, combine the water, salt, sugar, fennel seeds, peppercorns and bay leaves in a large pot. Bring to a simmer over medium heat, stirring to dissolve the salt and sugar. Remove from the heat and allow to cool to room temperature. Transfer the brine to very large bowl and add the pork, weighting the pork down with a plate to keep it submerged). Cover and refrigerate overnight. Drain the pork and return it to the bowl. Cover with fresh water and weight it down again with a plate. Soak at room temperature 2 hours. Position a rack in the top third of the oven and preheat to 350°F (180°C). Drain the pork and pat it dry with paper towels. Transfer to a rack set in a large roasting pan. 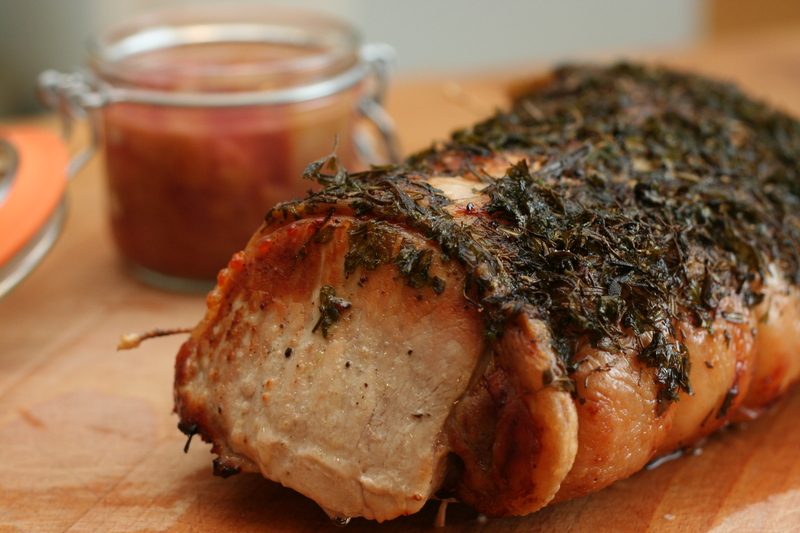 Rub the pork all over with olive oil, then sprinkle with the fresh herbs, pressing to adhere. Sprinkle generously with freshly ground black pepper. Roast for about 1 hour 40 minutes, until a meat thermometer inserted into the center of the pork registers 150°F (65.5°C). Transfer the pork to a cutting board and cover loosely with foil. Allow the pork to rest for at least 10 minutes, then cut into 1/4‐ to 1/2‐inch‐thick slices. Serve with the compote. Halve the fennel bulbs lengthways, then slice thinly. Heat the butter and olive oil in a pan over a medium heat. Add the fennel and saute for about 10 minutes, until softened. Season to taste with salt and pepper.